Since Nintendo launched its Switch console back in March 2017, it has taken the world by storm. It’s Nintendo’s most popular gaming console ever and has sold more than 10 million units in under 9 months. The huge popularity and the modded nature of console have made people to try out different things for the Switch. 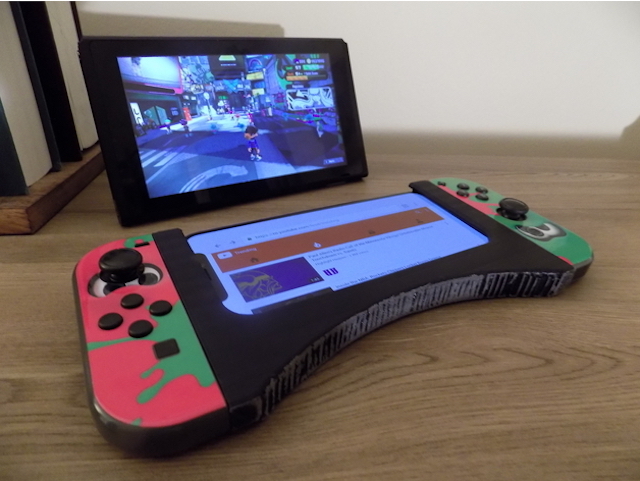 We have already seen people using JoyCons to play games on Android devices, saw the release of the Nintendo Switch Emulator on PC, Mac, and Linux, and now someone has just 3D painted a custom accessory which can be used to connect Nintendo Switch Joy-Cons to an iPhone or Android device. According to a blog post published on HTXT, Nathan Backer is the one to thank for this new accessory. According to Nathan Backer, he created it within an hour using the Fusion 360. He first created it for the iPhone X, and spent another 15 minutes on the Samsung version. The Samsung version was created using a digital caliper tool to make sure everything fits. Nathan further said that it took him several tries to make sure that Joy-Cons slide on smoothly and are held in place. He was also good enough to make the designs available for free on Thingiverse. According to Baker, he was first using the mod to watch videos on his phone whenever the game was loading, however, it can also be connected with your phone with Bluetooth to play games on it. It’s also a good solution for browsing the Nintendo’s online app and any other software they release in the future.